The Houston Dash beat Sky Blue FC 6-1 on Saturday night at BBVA Compass Stadium in Houston, Texas. The Dash got goals from six different players in the win. Despite the positive result, the Dash were eliminated from playoff contention when the Red Stars beat the Pride on Saturday night. The Dash can’t pass the Red Stars and Utah Royals FC, the only two teams still in the playoff hunt, and they don’t hold the tiebreakers they would need to advance to the postseason either. Still, the win comes in a strong season for the Dash, who are 9-9-5 with 32 points, all franchise bests with one game remaining. They now have 35 goals this season, also a franchise best. Sky Blue FC still remain in search of their first win of the season, and drop to 0-16-5 with the result. The Dash scored the first goal of the game in the 22nd minute. Linda Motlhalo scored her first NWSL goal, the fourth-youngest player in NWSL history to score. The match went into halftime with Houston up 1-0, but the Dash scored five in the second half. Veronica Latsko scored in the 48th minute on an assist from Sofia Huerta. It’s Latsko’s fourth goal of the season. Sky Blue FC then got a goal from Imani Dorsey a few minutes later, also her fourth of the season. In the 65th minute, Huerta scored from a tight angle on an assist from Kealia Ohai. Huerta now has eight goals and six assists on the year. Ohai has four assists. Huerta then earned a penalty just two minutes later after being taken down in the box by Sky Blue defender Madison Tiernan. Rachel Daly buried it to make it 4-1. 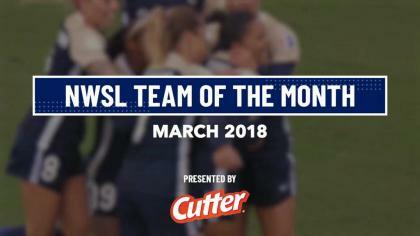 Daly has 10 goals in 2018, fourth in the NWSL. Then Haley Hanson scored her first NWSL goal in the 88th minute, a deft flick on a Kyah Simon corner kick. It’s Hanson’s first professional goal. The Dash made it 6-1 in the 90th minute courtesy of Thembi Kgatlana‘s second goal of the year. The Dash will play their final game of the season on September 8 on the road vs. the North Carolina Courage. Sky Blue FC have three games remaining and will next be in action on September 1 vs. the Washington Spirit. Match ends, Houston Dash 6, Sky Blue 1. Second Half ends, Houston Dash 6, Sky Blue 1. Goal! Houston Dash 6, Sky Blue 1. Thembi Kgatlana (Houston Dash) left footed shot from the centre of the box to the bottom right corner. Assisted by Haley Hanson following a fast break. Corner, Sky Blue. Conceded by Jane Campbell. Attempt saved. Savannah McCaskill (Sky Blue) right footed shot from outside the box is saved in the top right corner. Assisted by Carli Lloyd. Goal! Houston Dash 5, Sky Blue 1. Haley Hanson (Houston Dash) right footed shot from the centre of the box to the high centre of the goal. Assisted by Kyah Simon with a cross following a corner. Attempt saved. Kealia Ohai (Houston Dash) left footed shot from the centre of the box is saved in the top centre of the goal. Assisted by Amber Brooks. Substitution, Houston Dash. Nichelle Prince replaces Rachel Daly. Thembi Kgatlana (Houston Dash) wins a free kick on the right wing. Offside, Sky Blue. Christina Gibbons tries a through ball, but Imani Dorsey is caught offside. Attempt missed. Thembi Kgatlana (Houston Dash) right footed shot from the centre of the box is close, but misses to the left. Assisted by Rachel Daly. Attempt missed. Carli Lloyd (Sky Blue) left footed shot from outside the box is too high. Assisted by Savannah McCaskill. Substitution, Sky Blue. Amandine Pierre-Louis replaces Kaitlyn Johnson. Substitution, Houston Dash. Thembi Kgatlana replaces Sofia Huerta. Attempt missed. Christina Gibbons (Sky Blue) right footed shot from outside the box misses to the left. Assisted by Shea Groom. Attempt blocked. Janine van Wyk (Houston Dash) left footed shot from outside the box is blocked. Substitution, Houston Dash. Kyah Simon replaces Veronica Latsko. Attempt missed. Sofia Huerta (Houston Dash) header from the centre of the box is just a bit too high. Assisted by Taylor Comeau with a cross. Attempt saved. Carli Lloyd (Sky Blue) header from the centre of the box is saved in the top centre of the goal. Assisted by Dominique Richardson. Attempt missed. Carli Lloyd (Sky Blue) right footed shot from outside the box is just a bit too high from a direct free kick. Goal! Houston Dash 4, Sky Blue 1. Rachel Daly (Houston Dash) converts the penalty with a right footed shot to the bottom right corner. Penalty conceded by Madison Tiernan (Sky Blue) after a foul in the penalty area. Penalty Houston Dash. Sofia Huerta draws a foul in the penalty area. Goal! Houston Dash 3, Sky Blue 1. Sofia Huerta (Houston Dash) right footed shot from a difficult angle on the right to the bottom left corner. Assisted by Kealia Ohai with a cross. Attempt missed. Shea Groom (Sky Blue) header from the centre of the box is too high. Assisted by Imani Dorsey. Substitution, Sky Blue. Christina Gibbons replaces Mandy Freeman because of an injury. Substitution, Sky Blue. Savannah McCaskill replaces Jennifer Hoy. Goal! Houston Dash 2, Sky Blue 1. Imani Dorsey (Sky Blue) right footed shot from the right side of the six yard box to the bottom left corner. Attempt saved. Sofia Huerta (Houston Dash) header from the centre of the box is saved in the centre of the goal. Assisted by Veronica Latsko with a cross. Attempt saved. Sofia Huerta (Houston Dash) left footed shot from the centre of the box is saved in the centre of the goal. Assisted by Linda Motlhalo. Goal! Houston Dash 2, Sky Blue 0. Veronica Latsko (Houston Dash) header from the centre of the box to the high centre of the goal. Assisted by Sofia Huerta with a cross. Second Half begins Houston Dash 1, Sky Blue 0. First Half ends, Houston Dash 1, Sky Blue 0. Attempt saved. Carli Lloyd (Sky Blue) left footed shot from outside the box is saved in the centre of the goal. Assisted by Madison Tiernan. Offside, Houston Dash. Haley Hanson tries a through ball, but Rachel Daly is caught offside. Attempt missed. Sofia Huerta (Houston Dash) header from the centre of the box is just a bit too high. Assisted by Kealia Ohai with a cross. Offside, Houston Dash. Allysha Chapman tries a through ball, but Veronica Latsko is caught offside. Attempt saved. Rachel Daly (Houston Dash) right footed shot from outside the box is saved in the centre of the goal. Assisted by Sofia Huerta. Attempt missed. Shea Groom (Sky Blue) right footed shot from the centre of the box is close, but misses the top right corner. Assisted by Imani Dorsey. Attempt blocked. Taylor Comeau (Houston Dash) header from the right side of the box is blocked. Assisted by Sofia Huerta with a cross. Corner, Houston Dash. Conceded by Dominique Richardson. Attempt blocked. Sofia Huerta (Houston Dash) left footed shot from the right side of the box is blocked. Assisted by Taylor Comeau. Attempt missed. 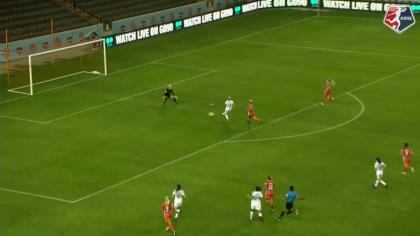 Carli Lloyd (Sky Blue) header from the left side of the six yard box is too high. Assisted by Dominique Richardson with a cross. Attempt saved. Shea Groom (Sky Blue) right footed shot from outside the box is saved in the top centre of the goal. Assisted by Imani Dorsey. Attempt saved. Sofia Huerta (Houston Dash) right footed shot from outside the box is saved in the bottom left corner. Assisted by Amber Brooks. Attempt missed. Veronica Latsko (Houston Dash) header from the centre of the box is close, but misses the top left corner. Assisted by Allysha Chapman with a cross. Attempt missed. Carli Lloyd (Sky Blue) right footed shot from the left side of the box is just a bit too high. Assisted by Imani Dorsey. Attempt missed. Madison Tiernan (Sky Blue) right footed shot from outside the box is just a bit too high. Assisted by Imani Dorsey. Goal! Houston Dash 1, Sky Blue 0. Linda Motlhalo (Houston Dash) right footed shot from outside the box to the bottom right corner. Attempt missed. Rachel Daly (Houston Dash) header from the centre of the box is close, but misses to the left. Assisted by Sofia Huerta with a cross following a corner. Attempt saved. Rachel Daly (Houston Dash) header from the centre of the box is saved in the bottom left corner. Assisted by Kealia Ohai. Corner, Houston Dash. Conceded by Imani Dorsey. Corner, Houston Dash. Conceded by Madison Tiernan. Offside, Houston Dash. Veronica Latsko tries a through ball, but Sofia Huerta is caught offside. Attempt blocked. Kaitlyn Johnson (Sky Blue) right footed shot from outside the box is blocked. Assisted by Shea Groom.